According to KPTV News, On Friday, February 1st, the Clark County Public Health Department confirmed 42 cases of measles. Seven other suspected cases are under investigation as the outbreak continues to grow. 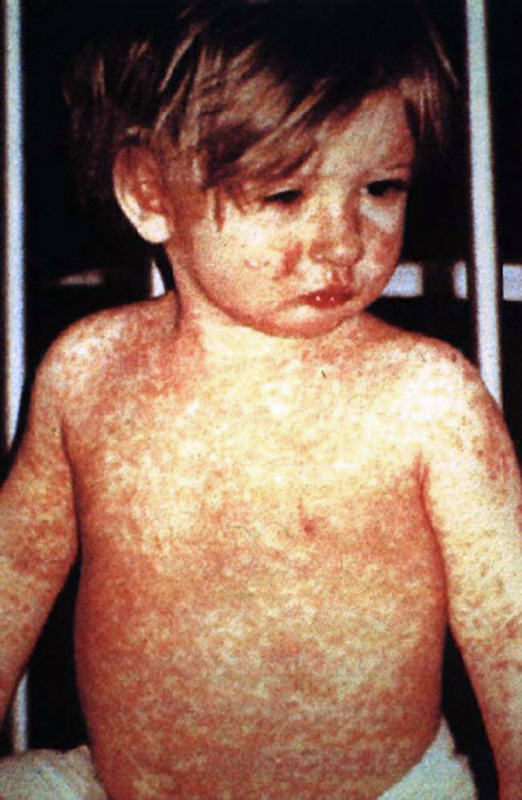 Subject: This child shows a classic day-4 rash with measles. | Photographer: CDC/NIP/Barbara Rice |As a work of the U.S. federal government, the image is in the public domain. Measles first cropped up about 800 A.D.. Back then it killed by the thousands. It wasn't until 1963 that mankind developed an inoculation for the virus. By the year 2000 measles had been wiped out in America, or so we thought. Model and actress Jenny McCarthy advocates for the benignly named Generation Rescue. This group is dedicated to helping children with autism. If they merely raised money to help children with autism, that would be fine. However, once you read their literature it becomes clear that one of their goals is to discourage the parents from vaccinating their children. Jenny McCarthy had a child who developed autism. Because the autism manifested shortly after her child had been vaccinated, she linked the two events in her mind. Now, she writes blogs and gives public speeches against childhood vaccinations. If she had any scientific background at all, she would know this. There are people out there taking health advice from an actress! Anyone who takes advice about the health of their child from a blogger is a special kind of stupid. Seriously, anybody can write a blog about anything. I write four blogs myself. As prolific as I am, you should never take life altering advice from me either. If you want advice about the health of your child, you should be getting it from a licensed medical professional. The first amendment gives us the right to say whatever we want. However, we also have the right, and the responsibility, to choose who we listen to. We don't have to obey the guy with the loudest blow horn. We need to use common sense and listen to those who actually know what they're talking about.